And therein we have a mystery. There is no explanation of the dividing of the Earth, or why Peleg’s name should be uniquely associated with it. If Peleg and Joktan were brothers, why wasn’t the Earth divided in their days? This vexing little question has rippled through my mind ever since I did an extensive study in Genesis some years ago. Obviously the same question has crossed the minds of a few theologians and even an occasional geologist. 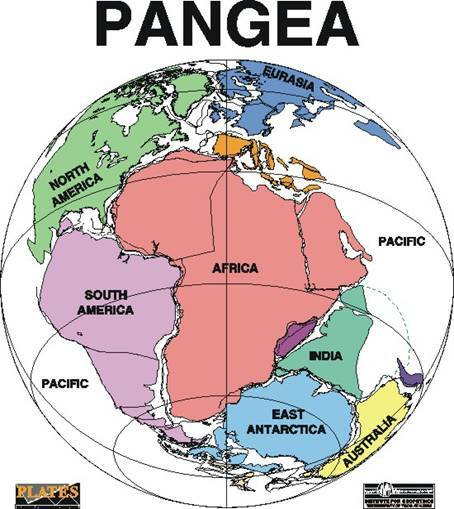 That is because there is a theory, based mostly upon new and intricate maps of the ocean bottoms and shapes of land, that the continents have been split apart, possibly more than once. For example, if you could push Europe and Africa flush against North and South America, they would almost fit perfectly together. We tend to agree with Morris on this. Had such an event occurred so soon after the catastrophic events bringing Noah and his followers through time to begin anew, we should have yet a second myth (memory) of escape similar to the flood story. Geologists and researchers that study plate tectonics tell us that \giant plates that are in constant movement under the surface of the planet. This is what causes earthquakes all over the world when these massive plates push into each other and something suddenly gives in to the pressure. Was a sudden and violent breaking apart of the continents the event that is being vaguely referred to in this strange Bible verse? An event like that would explain the vast divisions in the human population, history, race and language throughout the world. It would also help explain why ancient civilizations all over the world shared similar interests in building giant pyramids and why certain plant and animal species have been found on the European, African and American continents.